Winter means snow, snow means skiing and that means Sun Peaks to many avid skiers. We have one of the greatest ski resorts right out Kamloops' back door. 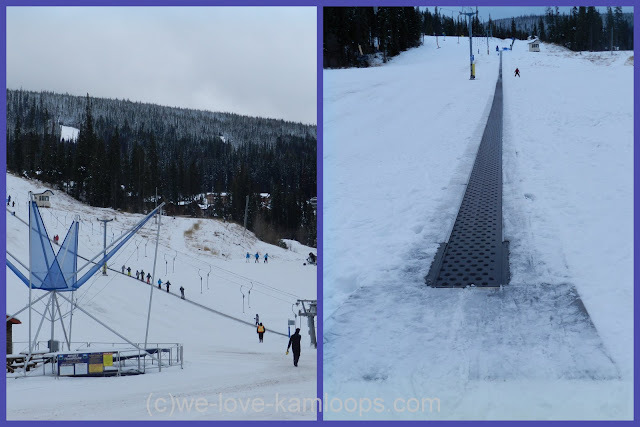 We visit Sun Peaks at different times of the year as there is always something to enjoy with year round activities, (click here to see Sun Peaks other seasons) but it has been awhile since we were there during the winter months. The Kamloops sky is blue with sunshine making today a perfect day for a drive up to Sun Peaks. The views on the way up offer some great photo opportunities but I am anxious to get to Sun Peaks while the sun is still shining and getting the best chance of some great photos. The low lying clouds up ahead were moving in and as we drove into the village of Sun Peaks, there was no sun to be seen but there was fresh snow on the hill, which is a good thing, too. The clouds in Sun Peaks will never discourage true skiers, there is a full parking lot so that meant that skiers had come up for this mid week day early in the season to begin their ski season. There had been a time when we spent most Sundays here, pre Sun Peaks Resort, when it was Mt. Tod with the Burfield Lodge and a couple of ski lifts. Although we are no longer skiers, we have some great family memories. Skiing is a sport that can be enjoyed by all ages and the snowboards also seem to be very popular not only with the young. Sun Peaks Resort has grown over the past several years, and looking at the map of the ski hills, shows a zillion more routes to ski than there used to be. There are 124 trails including 13 glade areas, which are the ones not regularly patrolled, so never ski those alone. Most of those trails are above the clouds today, now that would make some great photos! Fresh new snow and sunshine while looking down on the clouds! There are all kinds of reasons to stay at Sun Peaks for more than just a day of skiing. There are hotels, hostels, B&B’s, inns, lodges, condo and town homes, too for overnight visits. Many of them are ski-in and ski-out which sounds like the best way to go. There are restaurants and nightclubs, too, as well as many events to enjoy all through the seasons. The day wouldn’t be right if we didn’t spend some time sitting and watching the kids enjoy the bunny hill and others skiing out of the clouds to the bottom of the hill. The best way to do that was while we enjoyed some lunch at Mesa’s Grill, great service and food, too. There are a total of 11 lifts including 5 quad chairs on the 3 mountains of Sun Peaks including the Sundance Express seen from our viewpoint in the village. Mt. Tod is the tallest peak sitting above the clouds today with an elevation of 2152 m (7060’). There are plans for opening up more runs on Mt. Tod and Mt. Morrisey, elevation 1675m (5495’), coming soon. The village is quiet today but stores are open for business, and they offer great services and merchandise, be sure to visit them while you’re visiting the alpine village at Sun Peaks Resort. There is also an outdoor skating facility, tube park, a sports centre with a heated outdoor pool and the Sundance Kids Center for child minding. Sun Peaks is a great place to visit for every member of the family, even if you’re not a skier. We turned off the Yellowhead Highway at Heffley Creek to follow Tod Mountain Rd. and it was right at this junction that we were stopped in a road block on our way to Sun Peaks. The time had come for the winter tires or chains to be put on the cars and trucks, and there was no passing this location unless that had been done. The roads may look good to this point but winter conditions have arrived in the mountains and care must be taken. We had a great visit to Sun Peaks in spite of the lack of sunshine and know you will, too. Winter has arrived so let the fun begin. To learn more, visit the Sun Peaks website. Just another reason why we love Kamloops.